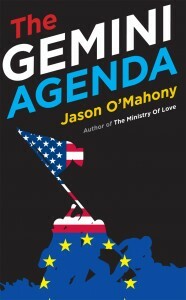 Jason O Mahony » Blog Archive » The Gemini Agenda: a little taste. The Gemini Agenda: a little taste. The Gemini Agenda: A plan to take over the world before some other fella does. Honorius Plenty III, on his twenty-first birthday, had learnt in this very room that his great-grandfather had sunk the Titanic. The billionaire swivelled in his chair to face the floor-to-ceiling window that afforded him a clear view of Central Park. He had grown up in this huge penthouse, taking possession of it after his father had died, and yet he never grew bored of the view of the city. When he needed to think, this was where he turned, dimming the lights to allow him to drink in the flickering vista of the park and the skyline, feeding his sub-consciousness, somehow allowing an idea to emerge. He still recalled the day thirty years ago. His father, with whom he had had an indifferent relationship, had summoned him, sat him down, and opened the wall safe. From it he had withdrawn a worn leather-covered journal and returned to his desk. He had then begun reading. That morning, Honorius Plenty III had finally understood why his father seemed to carry the world’s burdens upon his shoulders. He had always assumed that his father was just a dour man who took the managing of the world’s third-largest private family fortune with an overdone sense of gravity. As his father spoke, carefully reading passages from the first Honorius Plenty’s personal diary, the young Honorius realised that his father was borne down with the guilt that his family fortune was based on the deaths of thousands of people in possibly the greatest theft of all human time. The diary described the massive ship slipping under the icy, still water, and the dark night, and the cries and moans of the survivors. It had been the lack of wind that had done for the pride of Belfast. The stillness of the night meant that no waves crashed against the side of the wall of ice, and so it had not been spotted by the lookout until it was too late to allow for adequate remedial action. Or at least, that was how his great-grandfather had wanted history to see the events of April 14th and 15th 1912. The truth was different. The iceberg was not the cause of the tragedy. The actual cause was a British master criminal who had meticulously planned the operation, having received a fabulously enticing nugget of information from one of his many spies and retainers. This particular one had been a senior official of His Majesty’s Treasury who indulged in both opium and the delights of being spanked by dusky maidens from the Dark Continent. The collision with the iceberg was not an accident, but rather had been contrived with the use of an electrically powered tugboat that had previously been anchored to an iceberg within the Arctic Circle. Engineers had spent six weeks excavating and securing the buoyant mountain to the craft, ensuring the vessel would remain both well hidden and manoeuvrable. Contrary to both historical belief and James Cameron, the impact of the iceberg caused only minor damage to the mighty ship’s hull. It did, however, provide a well-planned and executed distraction for the limpet mines planted along the hull in specific locations. Each was radio controlled, and each exploded as the iceberg neared its position. Each device penetrated the hull and permitted millions of gallons of water to overwhelm the vessel’s overly optimistic anti-flooding devices. Regardless of how the flooding occurred, history observes that from that point on the vessel was condemned to a tomb on the bottom of the Atlantic. As the diary proved, history got that one wrong as well. The Titanic did sink beneath the waves, depriving over fifteen hundred individuals of their lives. What history had not recorded was the fact that engineers hidden within the Titanic herself, in concealed oxygen-supplied compartments, immediately activated electrically powered compressed air pumps. At the same time radio-controlled plates secretly fitted beneath the ship’s waterline were moved mechanically into place, sealing the punctures in the hull. This complex operation had the effect of preventing the ship from sinking to the ocean floor, instead suspending her sixty metres beneath the water’s surface. Seven days after sinking, and with the area clear of recovery vessels, the pumps were activated. The ship broke the surface again, and was moved out of shipping lanes by the now camouflage-free tugboat. This operation was, coincidentally, the reason why in 1985 it took Dr Robert Ballard’s team so long to locate the wreckage. She was, quite literally, not where she should have been. The vessel was boarded, and the specific cargo removed with explosives from its strong-room and then transferred to the tugboat. Two other vessels were also required to assist, such was the size of the cargo. Once the cargo had been removed, the mechanical plates holding back the water were jettisoned, causing the ship to flood bow first, pulling its stern and magnificent propellers up into the air before snapping its spine and severing the beautiful behemoth in twain. Although it is forgotten now, Britain in 1912 was a nation paralysed by fear of foreign invasion, a paralysis fuelled by the burgeoning market in invasion literature such as Erskine Childers’s The Riddle of the Sands. As a result, the British government, wary of war with Imperial Germany, had begun to make provisions for a number of eventualities, one being a defeat by Germany and possible invasion. Under such duress, His Majesty’s Treasury instructed that one of the defensive measures undertaken was that two-thirds of the British Exchequer’s gold reserve was to be moved to Canada for safe-keeping. With the benefit of hindsight, it was not a good idea; although on the plus side, it did create the world’s first billionaire. It also demonstrated that when rotund Belfast pillars of society declare that “God Himself” cannot sink a given vessel, well, that’s just looking for trouble.